That’s what I was saying. If there is no object to your attention, you are nowhere; or, you are everywhere, you are free. You have become freedom. This second sutra says: Thinking no thing – or, thinking nothing – will limited-self unlimit. If you are not thinking, you are unlimited. Thinking gives you a limit, and there are many types of limits. You are a Hindu – it gives a limit. Hindu, to be a Hindu, is to be attached to a thought, to a system, to a pattern. You are a Christian – then again you are limited. A religious man cannot be a Hindu or a Christian. And if someone is a Hindu or a Christian, he is not religious – impossible – because these are thoughts. A religious man means not thinking thoughts; not limited by any thought, by any system, by any pattern; not limited by the mind, living in the unlimited. When you have a certain thought, that thought becomes your barrier. It may be a beautiful thought – still it is a barrier. A beautiful prison is still a prison. It may be a golden thought but it makes no difference, it imprisons you all the same. And whenever you have a thought and you are attached to it, you are always against someone, because barriers cannot exist if you are not against someone. A thought is always a prejudice; it is always for and against. I have heard about a very religious Christian man who was a poor farmer. He belonged to the Society of Friends, he was a Quaker. Quakers are non-violent; they believe in love, in friendship. He was coming from the city to his village on his mule cart, and suddenly, apparently without any cause, the mule stopped and he would not budge. He tried, he persuaded the mule in Christian ways, he persuaded the mule in a very friendly way, a non-violent way. He was a Quaker: he couldn’t beat the mule, he couldn’t use strong words, he couldn’t abuse, scold, but he was filled with anger. But how to beat the mule? The Christian has his own world, and the non-Christian is opposite. The Christian cannot conceive that the non-Christian can reach the kingdom of God. A Hindu cannot conceive, a Jain cannot conceive, that others can enter into that realm of bliss – impossible. Thought creates a limitation, a barrier, a boundary, and all those who are not for are taken to be against. One who is not in agreement with me is against me. How can you be everywhere? You can be with the Christian; you cannot be with the non-Christian. You can be with the Hindu, but you cannot be with the non-Hindu, with the Mohammedan. Thought is bound to be somewhere against – against someone or something. It cannot be total. Remember: thought cannot be total; only no-thought can be total. Secondly: thought is always from the mind, it is always a by-product of the mind. It is your attitude, your speculation, your prejudice; it is your reaction, your formulation, your concept, your philosophy, but it is not existence itself. It is something about the existence; it is not existence itself. A flower is there. You can say something about it; that is a thought. You can say it is beautiful, you can say it is ugly, you can say it is sacred, but whatsoever you say about the flower is not the flower. The flower exists without your thoughts, and whenever you are thinking about the flower, you are creating a barrier between you and the flower. The flower doesn’t need your thoughts. It exists. Drop your thoughts, and then you can drop yourself into the flower. Whatsoever you say about a rose is meaningless, howsoever meaningful it appears, it is meaningless. What you say is not needed. It is not giving any existence to the flower. It is creating a film between you and the flower; it is creating a limitation. So whenever there is thought, you are debarred; the door is closed to existence. If you don’t think, if you simply are, fully alert, aware, but without any clouds of thought, you are unlimited. The body is not the only body – a deeper body is the mind. Body consists of matter; mind also consists of matter – subtle, more refined. Body is the outer layer, mind is the inner layer. And it is easy to be detached from the body. It is more difficult to be detached from the mind, because with the mind you feel you are more yourself. If someone says that your body looks ill, you don’t feel offended. You are not so attached; it is a little away from you. But if someone says your mind seems to be pathological, ill, you feel offended. He has insulted you. With the mind you are nearer. If someone says something about your body you can tolerate it. If someone says something about your mind, it is impossible to tolerate it, because he has hit deeper. The mind is the inner layer of the body. Mind and body are not two: the outer layer of your body is the body and the inner layer is the mind. Just as if you have a house: you can see the house from the outside, and you can see the house from the inside. From the outside the outer layer of the walls will be seen; from the inside the inner layer. The mind is your inner layer. It is nearer to you, but it is still a body. In death your outer body drops, but you carry the inner, subtle layer with you. You are so attached to it that even death cannot separate you from your mind. Mind continues. That’s why your past births can be known, because you are still carrying all the minds that you ever had. They are there. If you were a dog once, the dog mind is still with you. If you were a tree once, the tree mind is still with you. If you once were a woman or a man, you carry those minds. All the minds are carried by you. You are so attached to them that you never lose the grip. In death the outer dissolves, but the inner is carried. It is a very subtle material thing. Really, just vibrations of energy, thought vibrations. You carry them, and according to your thought pattern that you carry, you enter a new body. According to the thought pattern, the desire pattern, the mind, you again create a new body for yourself. The blue-print is in the mind, and the outer layer is again accumulated. The first sutra is to put aside the body. The second sutra is to put aside the mind, the inner body. Even death cannot separate you – only meditation can separate. That’s why meditation is a greater death; it is a deeper surgery – deeper than death itself. That’s why so much fear. People go on talking about meditation but they will never do it. They will talk, they can write about it, they can preach about it, but they will never do it. A deep fear exists about meditation, and the fear is of death. Those who do meditation, they come one day or another to the point where they are scared, thrown back. They come to me and they say, ‘Now we cannot enter more. It is impossible.’ A point comes where one feels that one is dying. And that point is of a deeper death than any death, because now the innermost is being separated; the most inner identity is being shattered. One feels one is dying; one feels now one is moving into non-existence. A deep abyss opens, infinite emptiness opens. One is scared, runs back to cling to the body so that one is not thrown, because the earth beneath is moving, is being removed. A valley is opening, a nothingness. So people, even if they try, they always try superficially; they play with meditation. They are unconsciously aware that if they move deep they will be no more. And that’s right, the fear is true – you will not be yourself again. Once you have known that abyss, that shunya, the void, you will not be the same again. You come back, but you are resurrected, a new man. The old has disappeared. You cannot find even a trace of it, of where it has gone. The old was the identity with the mind. Now you cannot be identified with the mind. Now you can use the mind, you can use the body, but they have become instruments; you are above them. Whatsoever you do, you can do, but you are not one with them. This gives freedom. But this can happen only when Thinking no thing. Hmm – this is very paradoxical – Thinking no thing. You can think about things. How can you think about no thing? What does this ‘no thing’ mean? And how can you think about it? Whenever you think about something it becomes a thing, it becomes an object, it becomes a thought, and thoughts are things. How can you think no thing? You cannot, but in the very effort – the effort to think no thing – thinking will be lost, thinking will be dissolved. How can you think about it? There was no face before birth; the face comes with the birth. The face is part of the body. You have no face; only the body has a face. Close your eyes and you have no face. You know about your face through the mirror. You have not seen it yourself, and you cannot see it, so how can one think about the original face?¿ But one can try; the very effort will help. For months together the seeker comes again and again. He finds something, imagines something, and he sees the face – ‘The original face is like this?’ And the master says, ‘No.’ And every time this ‘No, no’, and by and by he becomes more and more puzzled. He cannot think. He tries and tries and tries and fails – that failure is the basic thing. One day he comes to a total failure. All thinking stops in that total failure and he comes to realize that the original face cannot be thought. Thinking stops. And whenever this last time happens to a seeker, when he comes to the master, the master says, ‘Now there is no need. I see the original face.’ The eyes have become vacant. The seeker has come not to say something, but just to be near the master. He has not found any answer. There was none. He has come for the first time without the answer. There is no answer to it. He comes silently. Every time he had come he had some answer. The mind was there, the thought was there – he was limited by that thought. He had found or imagined some face – he was limited by that face. Now he has become original; now there is no limit. Now he has got no face, no idea, no thought. He has come without any mind. This is the state of no-mind. In this state of no-mind, the limited-self unlimits. The limits are dissolved. Suddenly you are everywhere, suddenly you are everyone. Suddenly you are in the tree and in the stone and in the sky and in the friend and in the enemy – suddenly you are everywhere. The whole existence has become just a mirror – you are everywhere, mirrored. This state is the state of bliss. Now nothing can disturb you, because nothing exists except you. Now nothing can destroy you; nothing exists except you. Now there is no death, because even in death you are. Now nothing is opposed to you. Alone, you exist. Both are true, because when everything is included in me, there is no sense in calling myself. The I is always opposed to the you; I is always opposed to thou. In relation to you it is meaningful. When there is no you, I becomes meaningless. So Buddha says there is no I, nothing exists. Either everything has become you, or you have become a non-being and you dissolve into everything. Both the expressions are true. Of course, no expression can be totally true, that’s why the opposite expression is always also true. Every expression is partial, part; that’s why the opposite expression is also true – that too is part of it. Remember this. Whatsoever you express may be true and the opposite also may be true – the very opposite. Really, it is bound to be true, because every expression is only a part. And there are two types of expression: you can choose the positive or you can choose the negative. If you choose the positive, the negative seems to be untrue. It is not; it is complementary. It is not really opposed to it. So whether you say Brahma – the total – or you say Nirvana – the nothingness – it is the same. Both connote the same experience, and the experience is this – thinking no thing, you come to know it. Some basic things have to be understood about this technique. One: thinking, you are separated from existence. Thinking is not a relation, it is not a bridge, it is not a communication – it is a barrier. Non-thinking you are related, bridged; you are in communion. When you are talking to someone, you are not related. The very talk becomes a barrier. The more you talk, the further away you move. If you are with someone in silence, you are related. If the silence is really deep and there are no thoughts in your mind and both the minds are totally silent, you are one. Two zeros cannot be two. Two zeros become one. If you add two zeros they don’t become two, they become a bigger zero – one. And, really, a zero cannot be bigger – more big, or less big. A zero is simply a zero. You cannot add something to it, you cannot deduct something from it. A zero is whole. When ever you are silent with someone, you are one. When you are silent with existence, you are one with it. This technique says be silent with existence and then you will know what God is. There is only one dialogue with existence and that is in silence. If you talk with existence, you miss. Then you are enveloped in your own thoughts. Try this as an experiment. Try it with anything as an experiment – even with a rock. Be silent with it – take it in your hand and be silent – and there will be a communion. You will move deep into the rock and the rock will move deep into you. 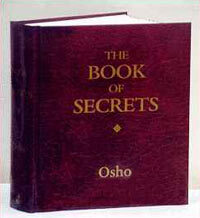 Your secrets will be revealed to the rock and the rock will reveal its secrets to you. But you cannot use language with it. The rock doesn’t know any language. Because you use language, you cannot be related to it. And man has lost silence completely. When you are not doing anything, then too you are not silent; the mind goes on doing something or other. Because of this constant inner talk, this continuous inner chattering, you are not related to anything. Not even to your beloved ones are you related, because this chattering goes on. This is not the question really. Love is not possible. Love is a flower of silence. It flowers only in silence, because it flowers in communion. If you cannot be without thoughts, you cannot be in love. And then to be in prayer is impossible – but even if we do prayer we chatter. To us, prayer is just chattering with God. We have become so conditioned to chattering that even if we go to the church or to the temple we continue chattering there also. We chatter with God, we talk with God. This is absolute nonsense. God, existence, cannot understand your language. Existence understands only one language – that is of silence. And silence is neither Sanskrit nor Arabic nor English nor Hindi. Silence is universal; it doesn’t belong to anyone. There are at least four thousand languages on earth, and everyone is enclosed in his own language. If you don’t know his language you cannot be related to him. You cannot be related. If I don’t understand your language and you don’t understand my language, we cannot be related. We are strangers. We cannot penetrate each other, we cannot understand, we cannot love. This is happening only because we don’t know a basic universal language – that is silence. Really only through silence is one related. And if you know the language if silence then you can be related to anything, because rocks are silent, trees are silent, the sky is silent – it is existential. It is not only human, it is existential. Everything knows what silence is; everything exists in silence. If a rock is there in your hand, the rock is not chattering within itself and you are chattering – that’s why you cannot be related to the rock. And the rock is open, vulnerable, inviting. The rock will welcome you, but you are chattering and the rock cannot understand the chattering – that becomes the barrier. So even with human beings you cannot be in a deep relationship; there can be no intimacy. Language, words, destroy everything. Meditation means silence: not thinking about anything. Not thinking at all, just being – open, ready, eager to meet, welcoming, receptive, loving, but not thinking at all. Then infinite love will happen to you, and you will never say that no one loves you. You will never say it, you will never feel it. Now, whatsoever you do, you will say this and you will feel this. You may not even say it. You may pretend that someone loves you, but deep down you know. Even lovers go on asking each other, ‘Do you love me?’ In so many ways they go on enquiring continuously. Everyone is afraid, uncertain, insecure. In many ways they try to find out whether really the lover loves them. And they can never be certain, because the lover can say, ‘Yes, I love you,’ but it will not give any guarantee. How can you be at ease? How can you know whether he is deceiving you or not? He can argue, he can convince you. He can convince you intellectually, but the heart will not be convinced. So lovers are always in agony. They cannot be convinced of the fact that the other loves. How can you be convinced? Really there is no way to convince through language. And you are asking through language, and while the lover is there you are chattering in the mind, questioning, arguing. You will never be convinced, and you will always feel that you have not been loved, and this becomes the deepest misery. And this is happening not because someone is not loving you. This is happening because you are closed in a wall. You are closed within your thoughts; nothing can penetrate. The thoughts cannot be penetrated unless you drop the. If you drop them the whole existence penetrates you. You will become unlimited. You will become whole. You will become universal. You will be everywhere. And then you are joy. Now you are nothing but misery. Those who are cunning, they go on deceiving themselves that they are not miserable, or they go on hoping that something will change, something will happen, and they will achieve at the end of life – but you are miserable. You can create faces, deceptions, false faces; you can go on smiling continuously, but deep down you know you are in misery. That is natural. Confined in thoughts you will be in misery. Unconfined, beyond thoughts – alert, conscious, aware, but unclouded by thoughts – you will be joy, you will be bliss. Here you can find all of Shiva’s 112 Meditation Techniques. Here you can listen to the discourse excerpt Thinking No Thing. beautiful..osho words are like a poetry..just his words take me deep within..can keep on reading forever..thank you..